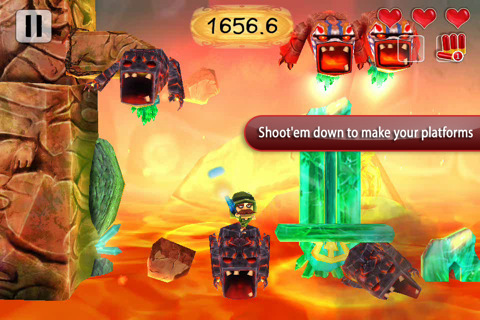 Released for the iPhone and iPod touch, you can download the Volcano Escape app for $0.99 during Spring of 2011. Get it for this new low price while it lasts. The regular price is 2 dollars. You’re about to be cooked in a Volcano!! Break free, climb up the walls and shoot those evil tribal minions and escape certain scorching doom. Platform your way to safety! 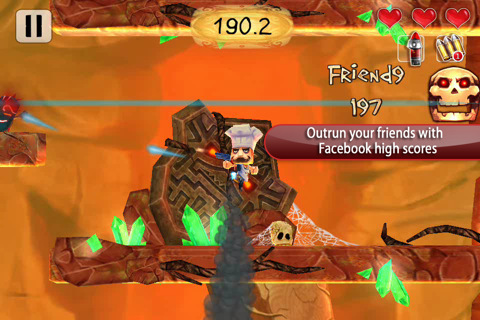 Volcano Escape is brought to us by Bravo Games, makers of Touch Racing Nitro. Simple concept meets excellent art. Jump on platforms and try and escape the volcano’s lava. You have the ability to ‘multi-jump’ while near a wall and you can shoot your gun at tribal creatures that litter the level trying to kill you. The environment textures are hand painted rock etchings with extremely pretty edge highlighting and shadowing. The title screen is a movie poster parody with great detailing and coloring. The characters are giant-headed ‘block-heads’ with great designs. The user interface looks great as well with wooden block buttons and clean and clear pause and health displays. Platforming is generally challenging, though for reasons that I can’t say are good things. First is the gravity in the game. When you jump, instead of landing normally, you float slowly back down. This helps you gain a few seconds of shooting and juggling a jump but also feels a lot like lag. Lava is rising beneath your feet and there is a lot of time pressure so this feeling of helplessness feels cumbersome. I did notice that my standard double jump could be used infinitely while I was next to a wall. This can act almost like a wall-climbing jump thing, but really, it’s unpredictable and feels like I was exploiting a glitch. The control layout needs some work as well. The shoot and jump buttons are placed on top of each other rather than side to side or in some customizable fashion. Shooting and jumping at the same time is almost impossible. You will either not jump the way you want for a few seconds or you will jump into an enemy because your thumb is shooting upwards when the enemy is just to your left. I can imagine how difficult it would be to develop a user interface that properly allows you to jump and shoot in all directions easily though. Maybe some kind of auto fire ability? Maybe the enemies could just be in the background and you just have to focus on platforming and racing against the lava below? Either way, the current state of the app suffers from the difficult to use controls. I really like the look and feel of Volcano Escape. It’s extremely pretty and the time pressure can be fun. Controls like the jumping and the very delayed landing however can punish you for minor button mistakes. There are some odd level design choices here and there that trap and kill you, and there are some moments where you will tap the jump button when you really mean to shoot and vice versa. Despite all of that though, the look is great, the theme is fun, and the overall package is ok. I give this an above average with great potential to be a full 5 star app with just a little more tweeking. AppSafari review of Volcano Escape was written by Joseph Ho on March 22nd, 2011 and categorized under App Store, Games, Platformer, Scrolling Shooter. Page viewed 3973 times, 2 so far today. Need help on using these apps? Please read the Help Page.